Barb & Boh, have been dutiful parents with their 4 eggs. Barb laid her first egg on the morning of March 20, the second on March 22, the third on March 24 (or 25), and the fourth on March 27. Around April 18, one of the eggs was identified as non-viable by the pair and removed from the cluster. While we do not know what caused the egg to become non-viable, we are confident that a human did not move the egg. Incubation period began March 24 (the second to last egg to be laid) and will last for around 29-32 days. Pip watch will begin April 22 (29 days after March 24) which signifies the first of the eggs beginning to hatch. Our season began with Boh & Barb’s first egg, which was laid at 6:55 a.m. March 19, 2018. The second egg came along at 4:56 p.m. on March 21. We woke up to the third egg on March 24, which Barb had laid during the night hours. She laid the fourth egg on March 26, at 11:36 a.m. They hatched on April 26 2:04 p.m., April 26 at 7:14 p.m., and April 28 before 6 a.m., and April 30 (out of cam view). In a public vote, the four chicks were named Scout, Squirt, Kalani, and Wally. The chicks were banded by a USFW Raptor Biologist on May 25. The falcon juveniles began to fledge on June 6 and by June 21, they were airborne! On August 1, two peregrine falcons were spotted in downtown Richmond, including a new banded juvenile female from Baltimore, Maryland. The new female falcon perched by the windows of the Department of Conservation & Recreation’s (DCR) office where a few observers were able to capture photos of the bird and get a read on her bands, helping Department of Game and Inland Fisheries(DGIF) to track down her identity. As it turns out it was Kalani! Her black and green bands are numbered 93 and AK, respectively. Her silver USGS band number is 1907-03424. Catching a glimpse of one of our native falcons in Richmond is an example of how connected our watershed and wildlife are. Photo courtesy of DCR. Read more about Kalani’s visit to Richmond. The last confirmed sighting of a juvenile falcon in the nest was August 8. Since then Boh and Barb have continued to use the nest. Often they can be seen in the early morning hours. We are looking forward to 2019 and hopeful for another amazing falcon camera season! Stay tuned for updates in the spring. The season started with four healthy eyasses in the nest. USFWS Raptor Biologist Craig Koppie has determined that three of the eyases were female and the smallest one a male. The weekend of June 3-4, 2017 was a tough one for the eyasses who had all fledged. One was discovered deceased on the 28th floor window ledge by a Transamerica building employee. Two others were found alive on the ground. One was rescued from the median by the building by a good samaritan and is with the raptor rescue group, Owl Moon Rescue. The other wound up in the good care of caretakers at the Maryland Zoo. This year Boh and Barb had another amazing nesting season up on the Transamerica Building in downtown Baltimore. During the Falcon Cam’s second year, Boh and Barb laid four eggs, successfully hatching all of them. However, sadly one of the baby falcons did not survive long after hatching. The rest of the falcons fledged, and started to learn how to survive on their own. 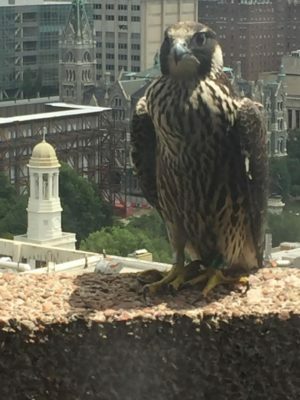 Shortly after fledging, a vigilant Transamerica employee informed the Chesapeake Conservancy that one of the falcons had flown into the building. U.S. Fish and Wildlife Service Raptor Biologist Craig Koppie temporarily removed the eyas and took it to a rehab facility. On June 16 at around 4pm, Koppie successfully released the eyas back into the nest. In July, many names were voted on for the three falcons but the winners were Charlie, Pauli, and Pratt, named after the streets below the Transamerica Building. Not long after, all three of the birds left the nest to live on their own. Special thanks to Transamerica, Skyline Technology Solutions, Cogent Communications, Shared Earth Foundation, the City of Baltimore, and 100 Light Street for making the peregrine falcon cam possible. Found on every continent except Antarctica, peregrine falcons (Falco peregrinus) are one of the best known conservation success stories and are believed to be the fastest bird in the world, traveling up to 200 mph during hunts. These amazing birds have recovered from near eradication in eastern North America, now making many large cities and coastal areas their homes. After a drastic population decline from 1950-1970 due to pesticide poisoning, peregrine populations have rebounded due to a large-scale captive breeding and release program. 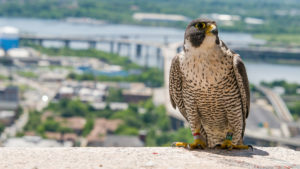 Scarlett, the building’s first falcon, was released by the Peregrine Fund at the Edgewood Arsenal area on the Chesapeake Bay in 1977 as part of this effort. Her first successful mating in 1984 with a wild peregrine, later named Beauregard, produced the first natural-born peregrines bred in an urban environment on the East Coast in three decades. Now, peregrine falcons are pervasive throughout the U.S., nesting on skyscrapers, water towers, cliffs, and more. Maryland’s restored peregrines have preferred man-made structures, like the 100 Light St skyscraper, to make their nest in the region. Structures like the Chesapeake Bay Bridge, Francis Scott Key Bridge, and Route 301 Potomac River Bridge have been known to have nesting peregrines as well. Because peregrines prey on other birds, they are particularly susceptible to changes in the health of the surrounding environment. There is potential for a tremendous amount of bioaccumulation of chemicals in their bodies, threatening the health and productivity of any future offspring. To make sure this charismatic bird continues to thrive, we are working to ensure that river corridors remain protected and that the Chesapeake Bay can support abundant fish and smaller bird populations. Learn more about the peregrine falcon with our frequently asked questions and fun facts, explore our National Wildlife Refuge App, or visit one of our regions many national and state parks and refuges to see them in the wild! 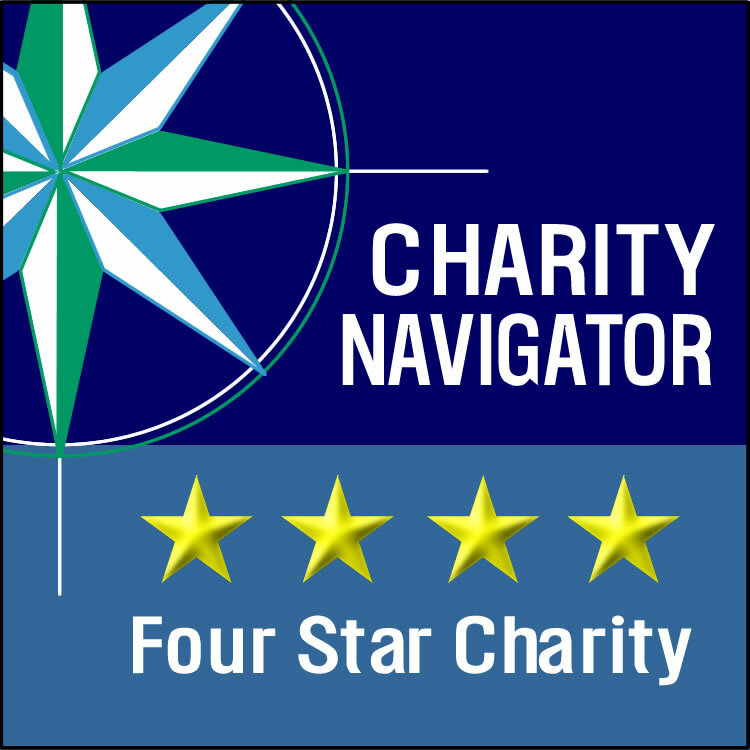 If you enjoy our Peregrine Falcon Cam, please consider donating to the Chesapeake Conservancy to help us in our efforts to protect their Chesapeake habitat. Click on the links below to view historical records and learn more about the peregrine falcons at 100 Light Street. Note: With the departure of USF&G from the building in the mid-1990s, records on the falcon family ended until the Chesapeake Conservancy’s cam went live in 2015. Sources: Cornell Lab of Ornithology, All About Birds – Peregrine Falcon, National Audubon Society, Peregrine Falcon and The Peregrine Fund.